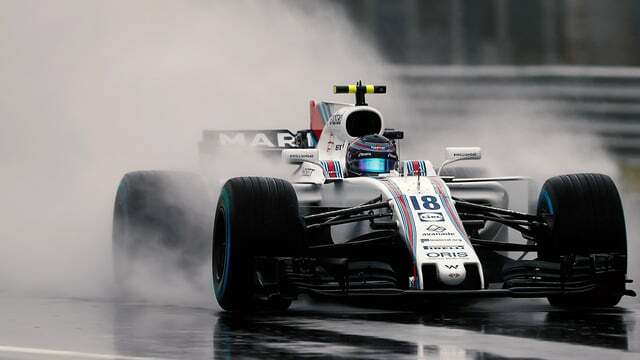 The rain really hit hard in Italy on Saturday, with only 16 minutes of running for final practice in the morning, and a heavily delayed qualifying after an initial run ended with Grosjean in the wall. After just a handful of tentative laps, the Haas crashed which brought out the red flags, followed by a two and a half hour delay. When things had cleared up somewhat, drivers resumed running, wet tyres bolted on their cars, and the next two qualifying sessions were without major incident. Palmer dropped out in Q1, whilst Sergio Pérez missed the cut for Q3 by the smallest of margins. Into the top ten shoot out, and it was Lewis Hamilton on pole again, with Ferrari dropping back to seventh and eighth. Red Bull performed well to finish second and third, but both drivers have penalties to take, which promotes the Williams of Lance Stroll up onto the front row of the grid, followed by an equally impressive Esteban Ocon.